What is India for safe food ? 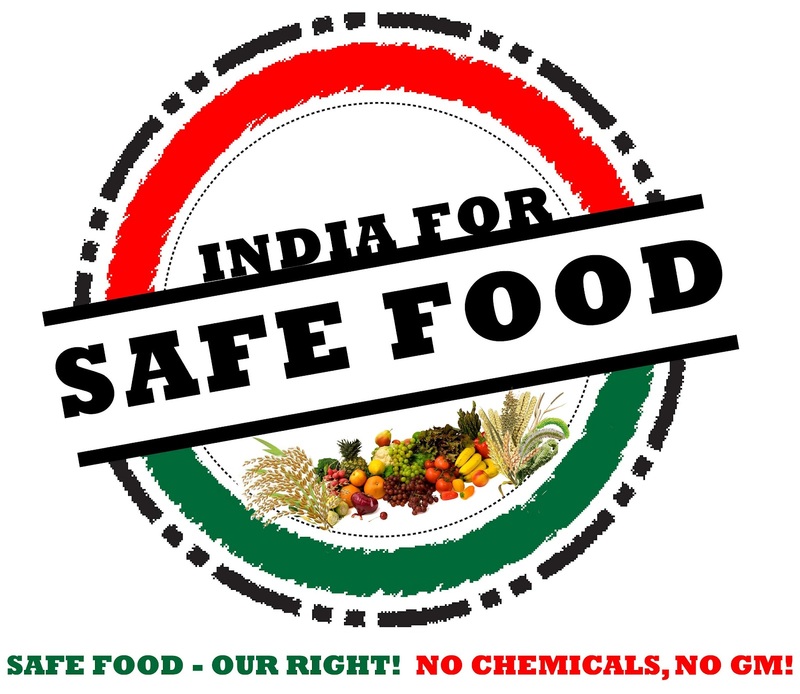 'India For Safe Food' (IFSF) is a movement for change amongst Indian farmers, consumers and the government to ensure that all Indians have access to safe food, devoid of toxic substances. It is being spearheaded by ASHA (Alliance for Sustainable & Holistic Agriculture), an informal network of hundreds of organizations and individuals across twenty states of India. Nationwide petition drive begins with events in mid June by various individuals / organisations & some continuing till July 2012.
a) Promote and encourage organic/ecologically sustainable/natural farming, without Pesticides and Genetically Modified Organisms (GMOs). c) Ban Pesticides that have been banned in other countries. Why the campaign? What is the problem? What is the solution? Today the food we consume and give to our loved ones is contaminated by toxins, genetically modified organisms, dangerous additives, preservatives and illegal adulterants. Indian agriculture uses enormous quantities of toxic pesticides and synthetic fertilizers for growing food and these are used indiscriminately by desperate farmers threatening their own health and that of the consumers. Our farmers, the annadatas, are themselves victims of pesticide poisoning. We have a lax attitude towards pesticide use and exposure to chemical toxins and its consequent casualties, as is evident by the way the cancer epidemic among farming families in Punjab is treated and the struggles of the endusulphan victims of Kerala and Karnataka and the 25+ years old battle of the Bhopal gas victims. Many or almost all pesticides in use in agriculture are either endocrine disrupters (that interfere with the hormone system) or carcinogens (cancer causing) or reproductive toxins or mutagens (causes change in genetic material), teratogens (capable of causing birth defects) or embryo toxins. Many of them qualify under more than one category. Globally concerted efforts are on to reduce, ban and restrict the use of many agro-chemicals. Yet, we are cavalier about these toxins, for example 67 pesticides that are banned in one or more countries are approved for use in Indian agriculture and are being regularly and routinely deployed. Therefore, it is time we worked towards reclaiming our right to eat safe food through safe farming which is sustainable, healthy and provides a livelihood for the farmer and healthy, nutritious food for the consumer. The good news is that there are numerous farmers, outlets, groups providing organic and safe food in almost every city in India. However we all need to work to increase their numbers and enable them to grow by choosing organic! Another piece of good news is that studies reveal that when exposure to toxins is stopped many of the negative effects reduce significantly and in some cases even disappear. However all these personal actions have to be combined with a social action which each one of us has to participate in, that is banning the use of these toxins in our agriculture, removing them from our food, water and the very air that we and our children breathe! Sadly, the birth defects and the cancers which have already happened are not going away anywhere and it is for each one of us to ensure that more people do not join these unfortunate ranks! This is a compelling reason to stop pouring these harmful chemicals into our bodies and the ecosystems we live in. These toxins do not stay limited to our food, they are everywhere, and the way to stop them is to ban them completely from agriculture. As Sandra Steingraber says in her incisive and lyrically written book on raising her children in a world full of toxins (titled: Raising Elijah), the cocoon we create for our children can’t protect them completely in this world where the air, water and food are toxic. We need to reduce, remove and eliminate these toxins, to achieve that, in addition to concerted individual efforts, we need committed policy changes. Again from the book an anecdote(178): during the cold war period a teacher in the US asked her third grade students how many of them thought that nuclear war would happen. Except one girl, all others raised their hands, when asked why she thought otherwise she answered, “because my parents are working to stop it”. Let your child be the one who says that I eat nutritious, toxin-free natural food because my parents are working to provide safe food! This campaign for safe food is the time for each one of us to stand up and be counted. We need to act now. In the interest of our own health and that of the future generations and for the health of the environment -eat organic, ask for a ban on pesticides, grow your own toxin-free food, compost your waste and use the compost to grow food to complete the cycle and spread the word…. 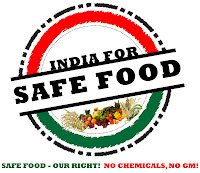 Join hands with India for Safe Food!